Paranasal sinuses - pneumatic cavities in certain bones of the facial skull, communicating with the cavity of the nose through narrow channels or cracks (Fig. 1 and 2). Fig. 1. Outside, or side wall of the nose (nasal turbinates removed): 1 - frontal sinus; 2 - hole back ethmoid cells; 3 - opening of the sphenoid sinus; 4 - line cut the average of the shell; 5 - off line of the bottom shell; 6 - hole maxillary sinus; 7 - hole anterior ethmoid cells. Fig. 2. The scheme of interrelations sinuses (side view): 1 - the maxillary sinus; 2 - the main bosom; 3 - cells of the lattice of the maze; 4 - frontal sinus. Anatomy. Maxillary, sinus, sinus is located in the body of the maxillary bone. Hole, connecting the maxillary sinus with the cavity of the nose, is in the middle nasal course. Frontal sinus located between the plates orbital parts, and scales of the frontal bone. It communicates with the cavity of the nose through the frontal-nasal canal, opened in front of the middle nasal passage. Lattice labyrinth consists of 2-5 and more different in size and shape pneumatic cells. The front cells appear in the middle of the bow, and back - at the top. The main, or wedge, sinus is located in the body of the main bone, directly behind the grating of the maze. On the front wall in each half of the sinus is the hole that report sinus nasal cavity. Mucosa of the sinuses in its structure is similar to the mucous membrane of the nasal cavity, but much thinner and its relatively poorer vessels and glands. 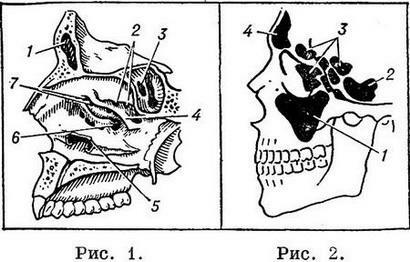 Research methods: in addition to the history, the study included an external examination and feeling region sinuses, front and rear rinoskopia, sounding through the holes, opens into the nasal cavity, diaphanosoma (see), x-ray examination, trial puncture and lavage of the maxillary sinus. Damage sinuses can occur at the closed trauma (stroke, falling, push, compression) and with injuries. Gunshot wounds sinuses are isolated, but more often are combined with the wounds of the nasal cavity, upper or lower jaw, mouth, upper part of the pharynx and orbit. When the sagittal direction wound channel through injury often results in death of the injured due to the damage of a cavity of a skull and its contents. Treatment. In recent cases of wounds produced stop bleeding and initial processing of wounds. With all the injuries require the introduction of prophylactic doses of tetanus serum. The disease. Acute and chronic inflammation. Acute inflammation of the sinuses (sinusitis) often make it difficult for influenza, acute rhinitis, measles, scarlet fever and other infectious diseases. Acute sinusitis can be catarrhal and purulent, chronic purulent, catarrhal (swollen-polypous) or mixed. Symptoms. General symptoms (fever, headache, malaise) are observed in acute or chronic inflammation of the sinuses. Patients complain of rich liquid or thick nasal discharge and its laying, often with one hand. Diagnosis of inflammation sinusal nose bet on the basis of patient complaints, anamnesis and objective examination of the nasal cavity. Additional research methods (diaphanosoma, radiography, sensing) allow you to specify the diagnosis of inflammation sinusal nose. Inflammatory diseases of the individual sinus - see Aeroginosa, Sinusitis, Steroidic, Sinusitis, Ethmoiditis. Pansinusitis - simultaneous inflammatory disease of all sinusal nose with one or both parties. Symptoms of pansinusitis consist of the effects of the defeat of the relevant sinuses. Treatment in acute cases, conservative, chronic and surgery. Patients with fever require bed rest. Apply antipyretics (acetylsalicylic acid 0.5 g, caffeine 0.1 g) one powder 2-3 times a day. To reduce swelling of nasal mucous membrane, especially in the area of holes sinuses, and facilitate the outflow of content from sinus grease the middle of the bow 1-2% solution of cocaine with a 3% solution of ephedrine or pour nose drops - 2-3% solution of ephedrine or cocaine. Pour nose drops better in the horizontal position of the patient. His head should be slightly thrown back and slightly turned the affected side, so that drops caught in the middle and upper nasal passages. Allergic rhinosinusopathy is a manifestation of Allergy in the sinuses may be isolated or in combination with other allergic diseases (bronchial asthma, eczema, urticaria and other). An acute attack of allergic sinusopatia usually sudden malaise, and nasal congestion, a heaviness in the head and profuse watery secretions (a transudate). When rinoskopia usually appear swollen mucous membrane of white or pale lilac hue. The disease runs a long time. Treatment - vasoconstrictive drops in the nose, antihistamines (Dimedrol, pipolfen), calcium supplements, steroids, vitamins. Mucocele occurs when closing holes sinus and tension of their bone walls accumulate in the bosom content. Most often affected frontal sinus and lattice maze. Mucocele often leads to the bulging eyes and the rejection of its outwards. Paranasal sinuses (sinus paranasales) - pneumatic cavities, adjacent to the nasal cavity and connected to it through narrow channels or cracks. Anatomy. On each side to the nasal cavity abut the temporomandibular (jaw), sinus, sinus, frontal sinus, lattice maze and partly main bosom. Maxillary, sinus, sinus (sinus maxillaris, s. antrum Highmori) is situated in the thick of the maxillary bone. In newborns maxillary sinus has the appearance of a narrow slit, increases with age and to 15 - 20 years reaches full development. This is the largest of all sinusal nose; capacity her in an adult from 3 to 30 cm3, on average 10-12 cm3. Form the maxillary sinus resembles a three-edged pyramid whose base is on the side wall of the nasal cavity and upper - cheek-bone of the upper jaw. The front wall facing toward the front, top, or ophthalmic, a wall separates the maxillary sinus from the socket, and the rear facing the apex and the wing-palatal the pits. Hole, connecting the maxillary sinus with the cavity of the nose (hiatus maxillaris), is in the middle nasal course. Frontal sinus (sinus moreover, is located between the plates orbital parts, and scales of the frontal bone. Frontal sinus newborns still missing; its development begins with the first year of life and usually ends to 25 years. There are lower, or ophthalmic, front, or front, rear, or brain, and the median wall. The average capacity of the frontal sinuses equal to 3-5 cm3. Frontal sinus communicates with the nasal cavity through the frontal-nasal channel (apertura sinus moreover), which opens in front of the middle nasal passage. Lattice labyrinth (labyrinthus ethmoidalis) consists of 2-5 and more different in size and shape pneumatic cells (cellulae ethmoidales), which are separated from the anterior cranial fossa orbital part of the frontal bone and sieve plate ethmoid bone, and from orbital - orbital paper plate (lamina orbitalis). Pneumatic cells of the lattice of the labyrinth of the newborn are a number of narrow pockets; they develop rather faster than any other sinuses. The front cells appear in the middle of the bow, and back - at the top. The main, or wedge, sinus (sinus sphenoidalis) is located in the body of the main bone directly behind the grating of the maze over Hayami and nasopharynx. Sagittal situated wall (septum sinuum sphenoidalium) sinus is divided into two in most cases is unequal in terms of. On the front, the most subtle, the wall in each half of the sinus is a hole (apertura sinus sphenoidalis). The development of the sphenoid sinus begins only after birth and ends in about 20 years. Mucosa of the sinuses in its structure differs little from the mucous membrane of the nasal cavity (see). It is much thinner and relatively poorer vessels and glands than the lining of the nasal cavity. The blood supply of the sinuses is made of branches of the internal and external carotid arteries, mainly through the ophthalmic, exterior and interior of maxillary artery. Vienna maxillary sinus anastomosis with the veins of the face and pterygoid plexus, and Vienna frontal sinus - with veins Dura, with longitudinal sinus and the cavernous sinus. In these ways the infection is sometimes gets in the eye socket or the cranial cavity. Innervation sinuses is carried out from the first and second branches of the trigeminal nerve, as well as from wing-palatal site. Research methods p. P. N., besides history, include an external examination and feeling, front and rear rinoskopia (see), sensing, diaphanosoma (see), x-ray examination, trial puncture and lavage of the maxillary sinus. X-ray examination allows us to judge the size and shape p. P. N., and the presence of pathological formations (see below x-ray Diagnostics of diseases of the sinuses). To this end, produce x-rays in a straight line, axial and lateral projections. Pathological condition p. P. N. - loss transparency - based on the symptom of a blackout on the radiograph. The necessary condition of the research is comparison of data radiography with the clinical picture. Fig. 1. A pronounced asymmetry of the maxillary sinuses. Anomalies of development. The lack of maxillary sinuses it is extremely rare. The asymmetry of their occurs much Cup (Fig. 1). Sometimes detect the absence of the frontal sinus (one or both). The asymmetry of the frontal sinus observed more often than maxillary; bone partition can be significantly displaced in one direction or another. Strongly pronounced pneumatization sinus with the formation of deep bays in the presence of unpleasant subjective sensations some authors refer to the disease (the so-called pnevmatikos). The main sinus may be rudimentary or nonexistent. Anomaly of the sphenoid sinus are bone dehiscence on its side walls. In these cases, mucosa of the sinuses may come into contact with Dura mater middle cranial fossa, with the scope of the internal carotid artery, cavernous sinus, optic nerve, verkhnepashino cracks and wing-palatal fossa. Damage sinuses can occur at the closed trauma (stroke, falling, push, compression) and with injuries. Gunshot wounds p. P. N. are isolated, but more often are combined with the wounds of the nasal cavity, upper or lower jaw, mouth, upper part of the pharynx and orbit. When the sagittal direction wound channel through injuries often lead to the death of the injured due to the damage of a cavity of a skull and its contents. At the cross, or front, the direction of the wound channel damage of vital formations are rare, so the prognosis for such wounds often favorable. Injured sinuses in most cases complicated by inflammation, which may be type-purulent or proliferative sinuitis. Fragments of shells, fragments of bones found in the sinuses, support the inflammatory process and delay recovery. The General condition of the wounded in superficial wounds p. P. N. suffer a little; at deeper (especially if the injuries at the base of the skull) are often observed loss of consciousness and short-term shock. Inflammatory processes in p. P. N. usually occur at higher temperatures (37,5-38 degrees), which gradually decreases to normal, or low-grade. The increase of temperature up to 39-40 degrees and the deterioration of the General condition may indicate a problem in the border with paranasal sinuses areas as phlegmon, purulent satikov, thrombophlebitis or septic condition, pneumonia. If the injuries frontal sinuses and lattice labyrinth remember about the possibility of defeat matter of the brain and its meninges suspected intracranial complications of the operation should be made possible before. In the diagnosis of gunshot wounds is necessary to define precisely the nature of the injury and the direction of the wound channel at the place of entry and exit wound of the projectile. It is very important x-ray examination. Because of the risk of infection should avoid rough sounding fresh cases of injury p. P. N. and sensing fistula with an upwards direction - in the area of lattice maze, primary and frontal sinuses. Reliable sign of a broken walls p. P. N. with simultaneous rupture lining its mucosa is emphysema persons (especially forehead) or sockets. Emphysema can occur even with mild, limited damage to the sinuses and spread far beyond their borders, covering the face, neck and chest and taking threatening. Treatment. In closed injuries that affected only the outer walls of the frontal, maxillary and ethmoid sinuses (which becomes clear from the x-ray in different projections), sometimes you can wait for surgical intervention. The development of abscesses is an indication for immediate surgical intervention. If you suspect a fracture or other damage to the posterior cerebral walls p. P. N. also shown an urgent surgery. In recent cases of injuries p. P. N. produce stop bleeding and initial processing of wounds. With all the injuries require the introduction of prophylactic doses of tetanus toxoid. In primary treatment remove superficial foreign body. More deeply located metallic foreign body from the sinuses and adjacent areas delete specialists depending on indications. Prophylactic against possible and intracranial septic complications appointed sulfa drugs and antibiotics.